What factors influenced your decision to go with the 16-bit aesthetic? Was it a hardware issue since it was being develop on ios or an artistic choice because you like the style/or are proficient in it? style, mostly it’s the Atari or early NES styles that are used. What were the pros and cons of working with the style? the work to produce the same sized sprites onscreen. Did you have any self imposed technical restrictions placed upon yourselves? case of monsters, 360 degrees of movement). How did the style effect the budget and development time? many of the advantages mentioned here are echoed in various review outlets. such as the large amount of content and smooth controls. that`s an element i`d always forgotten to include as a modernisation advantage, the element of analog control versus the stiff d-pads of yesteryear. 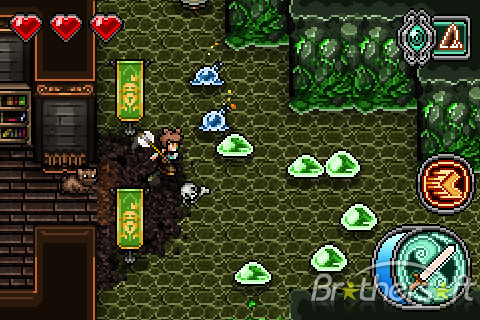 works for certain genres like platformers but for a top down rpg analog fits better. he also mentions something interesting, about more developers opting for a 8-bit style (gaijin games) which has always confused me, because 16-bit is more readable and aesthetically pleasing and also keeps the balance of nostalgic style. 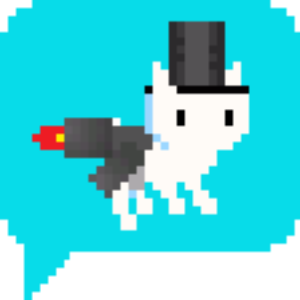 whereas 8-bit can come off as looking lazy if not done right. mage gauntlet was smart to adopt the 16-bit aesthetic. playing brings back many fond memories of chrono trigger and secret of mana only with all the fancy bells and whistles that stronger hardware can provide. I seriously recommend you give it a look, seeing how it`s going dirt cheap on the app store. 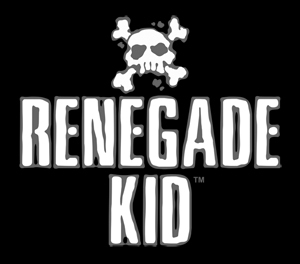 next up, is Jools Watsham founder of renegade kid. I asked him about his upcoming platformer mutant mudds. Q: What factors influenced your decision to go with the `retro` aesthetic? A: It was a combination of personal taste, prior work experience, and development speed. I personally really like the look of well-executed pixel art. I have worked on many games as a pixel artist, so retro pixel art is a comfort zone for my skill-set. I knew that I was going to be creating all of the artwork, so sticking with an 8-bit / 16-bit art style meant it would be relatively quick to produce. Q: What were the pros and cons of working with the style? Q: Did you have any self imposed technical restrictions placed upon yourselves in an attempt to emulate the feel of the 16-bit era? A: The way I approached it was to be inspired by the 8-bit / 16-bit era rather than be restricted by it. I did not feel the need to limit the color palette or effects in order to make the game look authentically retro. I think the limited color palette I am used to working with (less than 16 colors per element) is the only so-called restriction that was adopted. But, I never found the need to use more than 16 colors on anything. So, it never acted as a restriction for me. It was important to utilize the advanced technology of the 3DS as much as possible to make the game as fun as possible for today’s audience. Q: How did/does the style effect the budget and development time? A: Due to the fact that it was just me as the artist it reduced the budget required. The art style also meant I was able to produce the art fairly quickly. his third answer pretty much sums up area of research, about being inspired by the era rather than restricted by it. 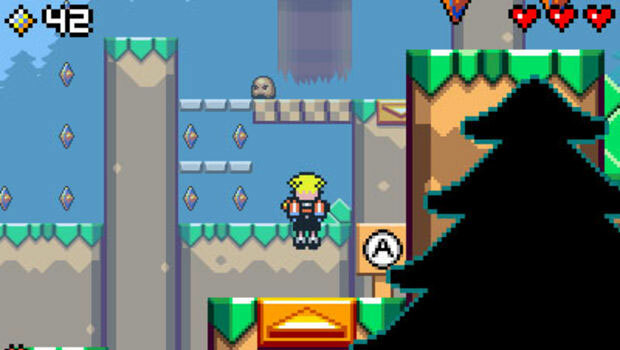 I would never have guessed that mutant mudds didnt adopt the strict original colour palette because the game looks so authentically retro. and using the 3D effect to make it relevant to todays audience was a clever move because it doesn’t detract from the style, it just enhances it. that and the market is starved of 3D content lately so this will help the title gain some prominence. he said, he`s the only artist working on this full fledged downloadable title for the Nintendo eshop and that`s quite remarkable. I originally thought there was a team working on it. another huge plus for the style of visuals. what factors influenced your decision to go with the `retro` aesthetic? So, with that in mind, it’s not like we made a decision to do a retro game – the game always was going to BE retro! There were some discussions as to how retro it should be though. Should it be 16bit era? 8 bit era? or an old arcade machine… ? But very quickly we decided on 8bit, for a few reasons – dev time was short (8bit graphics being an order of magnitude quicker to create than 16bit) AND it made for a better retro story. If we were going to make an old game, we might as well do the job right! · Feature iteration moves at a lightning pace compared to implementing and building with modern day assets. · Level building is QUICK. · It’s also difficult to think in terms of 8bit gameplay. A lot has happened in the last 20 or so years, and game design has changed considerably. Especially nowadays we hold players’ hands much than used to be the case. Making a game that feels 8bit, but with modern day sensibilities is a bit of a juggle. · We weren’t sure how it would be received. Sure, we (OOI) all love retro games, but would the players out there in the ‘real world’…? · did you have any self imposed technical restrictions placed upon yourselves in an attempt to emulate the `feel` of the era? Yes. We adopted the NES palette very closely, but as I remember there was one colour that we tweaked to change slightly (at Capcom’s request) It was something to do with the NES palette not having a colour that Capcom felt comfortable with for use as Rusty’s jacket…). Still, we retained the very limited NES palette pretty much and didn’t cheat (much!) Other than that we just tried to make the game feel retro, mainly in art terms – including cut-scenes, but also in how the game felt (played). We obviously didn’t do anything technically that wasn’t capable at the time other than probably display a few too many sprites in places. We even discussed emulating sprite flicker at one point and, while it wouldn’t have been too hard to do, we reckoned that was one feature players would be glad we’d not emulated! In general it made the game cheaper to produce than it would otherwise have been, but I think this was due to the artists we had, both of whom were very comfortable in this style. As for dev time, again, because of familiarity of style, it made producing the art assets MUCH quicker than it would have been if we’d plummed for 16bit or later. It’s also worth noting that since the systems we used were very simple, it meant that I myself could mock-up art assets, get them in the game and have mechanics / levels working before we needed art input. Gordon (OOI’s Tech Director and coder on this game) and I could iterate very quickly without an art bottleneck slowing us down. When art followed up behind, they knew exactly what the requirements were, making their job even faster. So, that’s it in a nutshell Stewart. Thanks for your interest in DVZ, it was a great ‘blast from the past’ project for me and the rest of us. I hope you had fun with it too! it`s hard to believe that it stuck so closely to the 8 bit palette because some environments in the game look outstanding and I can’t imagine them running on a NES. the speed of development and prototyping was something of a shock, i had no idea it was so insanely quick. the development style mentioned in the last question probably helped as well. he voices concerns about the masses enjoying the game and it`s style, and it`s a relevant issue. as i`ve mentioned in previous posts there’s more and more gamers who never grew up with the style and might not appreciate it or `get it. 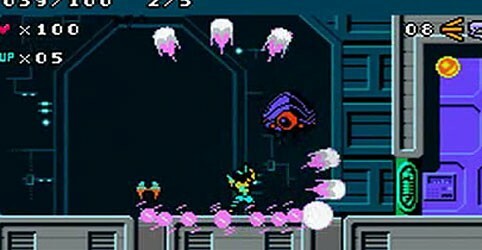 but if games like dark void zero continue to exist, then surely the spirit of retro gaming can stay alive and grow with all the contemporary touches that the masses can enjoy also. i.e aprils fools jokes 🙂 but aside from that. dvz had some very clever design especially with the levels and weapons. I think the overwhelmingly positive responses from these developers has shown me just how nice the gaming industry can actually be 🙂 objective 2 has been a huge success and the next step for objective 3 is to begin conceptualization of my three media tests. it`s been so long since i`ve actually been able to create any sprite media, i cant wait to get started!